General purpose amputee clip sling with velcro flap allows access to clothing for hygiene requirements. ArjoHuntleigh Double Amputee Sling with a Velcro flap is suitable for residents/patients with leg amputations above or below knee and is applied like a normal sling, without “log rolling”. 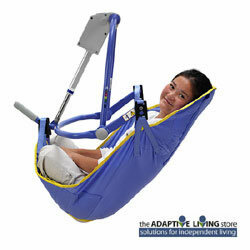 The adjustable strap allows access to clothing for hygiene requirements and toileting.